"A Mother of all greatness"
Unassumingly small-made yet stood the tallest among the humans in this world and lived a life like no one else perhaps nobody ever will. So tender and frail physically yet with the strongest heart and her indomitable spirit toiled relentlessly with every ounce of her incredible energy to serve the poor. She was in her early youth yet she had a mature heart and soul to understand fully the gospel of love and dedicated her whole life only to serve the dying and the suffering, crossing the frontiers of religious and ethnic differences among the people in need. Unthinkably simple was the life that she lived yet her every act is unimaginatively big and beyond compare. Most easily the greatest life lived for the world to be thankful and learn from, yet she was always grateful and eager to learn from the downtrodden and the needy just by loving them. 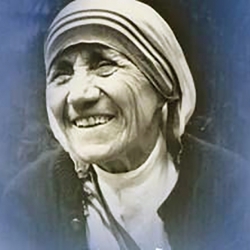 If there can be a personification of Holiness, goodness, kindness, love and compassion all summed up in an undeniably amazing life, it is and always will be the one lived by our own Mother Teresa. This beautiful soul taught us the true value and dignity of human life. Showed us the Godly way to understand and respect every human life and realize they are precious, whatever the condition may be, from womb to the tomb. This is a SoulPrints tribute to Mother Teresa.